I just completed my third DIY guitar experiment using Warmoth parts. 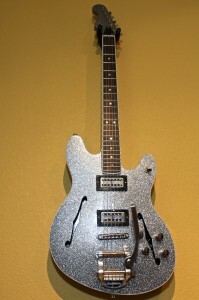 This one is a wacky Fender/Gretsch hybrid with a semi-acoustic Fender Starcaster body, a reverse, angled Strat neck, and various Gretsch-like elements, including TV Jones Filter’Tron pickups, a Bigsby/Vibramate vibrato, and a vulgar silver-sparkle finish — a tribute to the Gretsch Silver Jet, and the basis for this new guitar’s name: Kitschcaster. Mind you, it sounds nothing like a Starcaster. I ordered the body (which Warmoth calls the Mooncaster) in warm-toned korina, and the neck is mahogany. 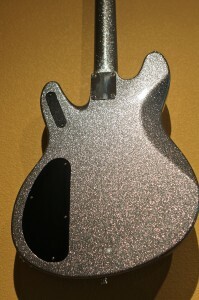 (Fender used bright-sounding maple for the original necks and bodies.) True to form, the Gretsch-style humbuckers provide a percussive, “plinky” attack quite distinct from PAF-style pickups. The Bigsby assembly also nudges things further from Fenderland. But I always dug the Starcaster’s offset semi-acoustic body, and I thought it would make a nice platform for my latest platypus. As before, I’m 100% delighted with Warmoth’s work. The finish is flawless (correction: was flawless till I dinged it), and everything fit together beautifully. The only hurdle came when installing the wiring. I failed to take into account the body’s thinness, and I didn’t have enough room to accommodate all the big push/pull and dual-concentric pots I’d planned to deploy. The comic highlight of the build came when I somehow managed to force a standard-sized pickup selector switch into the narrow lower horn. I disconnected a wire while doing so, and then found myself completely incapable of removing the switch. I took it to repair genius Gary Brawer, whose first comment was, “How did you get this in here? And more important, why?” But he managed to free the trapped part, and then he installed a cunning little access cover. Go, Gary! Yes, the neck is silver too. Gary Brawer added the pickup selector access cover. I’m especially besotted with Warmoth’s “Clapton” profile necks, which I’ve used in all three of my builds. They have a pronounced V shape that feels so comfy in my left hand, and provides relief for my left thumb joint, where, sadly, I’m feeling my first tentative twinges of arthritis. It’s a trip having three radically different guitars with identical neck profiles. I dig the sleek, comfy body as well, and I love its ability to generate musically coherent feedback. Anyway, consider this a work in progress. I’m still fussing with the tone circuit. (If I can find suitably sized rotary switches, I want to try a sort of “double Vartitone,” with separate treble-cut and bass-cut dials. If it works out as as planned, I’ll do another post on it.) I’ll also probably jigger with the built-in distortion, taking off some of the treble. Like my Bigsby equipped Les Paul, the Kitschcaster can have overly aggressive highs. Something about the combination of the Bigsby hardware and flatwound strings makes certain notes come screaming out of the amp. Both guitars benefit from a carefully controlled touch. But even now, I’m really stoked about this fun, cheesy-cool instrument. Good googly moogly that sounds good. Is yours missing the 5th knob? Re: aggressive high end with flat wounds- Personally I love that sound in your demos, I wish the bass line would step forward a bit, but I really really l like the way it stays clean (and distinct) as the upper registers distort. I can't imagine anything other than a post distortion EQ (or compressor) that would keep what I like and bring the bass out a bit more. Or maybe the second tone circuit could be post-fuzz? Beyond that, thanks for posting a clip again, really fantastic stuff. 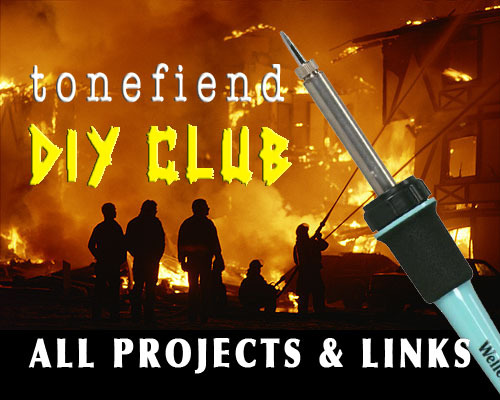 One of the many things I respect about you Joe is your ability to actually complete these projects… I have way too many builds/mods ‘in the works’. I tend to move/migrate from one to another and rarely view any as completed…. the curse of the modder I guess. But anyways, builds like this seem to bolster my recent feelings that there’s little need to buy from the main marketplace these days. The components for frankenbuilds are great quality and reasonibly priced and generally work out to be cheaper than buying from the market and spending hours and $$ to fix/correct/adapt them to satisfaction. The general value ratio (quality-price) is incredible these days from the market, but it’s still hit and miss. Electrics like these are fairly easy to put together using components from places like warmoth, but I’m still the slave of the market when it comes to acoustics. I just plunked down a wad of cash on a Loar LH 700 archtop. The body was brilliantly carved and tuned, the tone is amazing,but the neck is inexcusable. The lip of the neck is rough cut and unfinished (looks like a squirrel chewed on it), the body is completely unfinished under the open neck lip, the nut is cut wrong and the edges of the frets are tapered too far in so the any pressure on the E’s causes them to slide off. Given the amount of work they put into the body, the fact that they were unconcerned about a visibly botched neck (arguably the easiest thing to do well with modern machinery) just ticks me off. I’ll fix the neck because at that price point the quality of the body is still a tremendous value, but it’s so frustrating that I have to do that to make it playable. Which brings me back to your warmoth builds and the beauty of the current state of electric market. Hooray for Warmoth and I guess I just have to learn how to build my own acoustics. Cool axe, why don’t you try a Twin-T notch filter in order to soften those highs? You could apply it all the way by a SPDT or by a pot, I personally designed one which I like a lot. 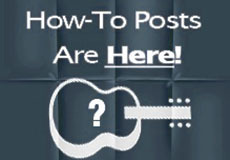 Big question here: How many guitars do you own? Absolutely awesome. I love what you did building the germanium boost right in. Great playing too. What is the twang piece you start at 1:13? Looks like you are having some fun now ! Nice build , interesting how it went together and what you put in it. Never had a use for reverse headstocks either but it sure is a neat WTF added touch. Good luck with the tweaks. You really need to come by here if you are ever in the area and see how poor people attempt to make guitars that have plans like that. Very cool , stay safe and have fun Joe. 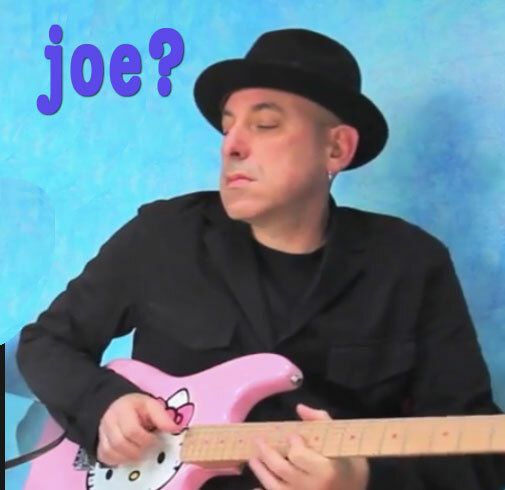 Very Cool Joe- I really like your approach to letting the guitar’s character come out, as opposed to trying to make it into a specific type of guitar. That seems to open the door to many more original tones. So many guitars have awesome sounds living within, but the owners don’t dig into them enough for them to come out- you definitely explore all the potential of your instruments and their personality. This guitar is right up my street both visually and sonically. The overdriven feedback is very reminiscent of my Les Paul Signature from 1974 (It too being semi-hollow) – this guitar btw has some odd controls on it for out of phase sounds and tone cuts, not dissimilar from from some of the tones you have created on your various examples. Did you use a roller bridge with the Bigsby? Thanks Joe. The guitar appears to be considerably smaller than the original; the Warmoth site claims only “slightly” smaller but they don’t bother to list the actual dimensions. Agree, but I commented on the aesthetics, not tone. I happen to like looks of large body thinlines; 335s, Starfires, Starcasters… big and curvy but not fat! Awesome axe! Still love ‘trons in the bridge, still kinda dislike them in the neck. It’s always surprising to hear how incredibly effective the Tonestyler is, really have to build me a DIY one ASAP, and I can’t wait to hear your rotary bass and treble cut experiment! Or how about a fitting pair into a SD Triple Shot? To my ears that Tron neck sounded alright anyway. Lipstick! I didn’t think of that but it would fit in my demented fantasy that the bridge ‘tron sort of asks for weird in the neck: toaster, Charlie Christian, gold foil, that kind of stuff. Even without swapping anything, it might just take the right amount of bass cut to get the neck ‘tron growly enough to better match the bridge. That guitar sounds and looks wonderful Joe. Semi's do seem to produce great clean tones. I'm a fan of V necks too. They feel great and provide the geatest mechanical stiffness with a slim profile. Oh — I tried out that double Varitone idea in this guitar, and it works great. I’ll post a demo real soon! Sounds fantastic, in your hands. Sweet looker too. What do you guess it weighs? I don’t know the exact weight in pounds — but I’d say more vintage Strat-like than vintage Paul-like, if that makes sense. Pretty light, in other words. Hey, Joe. Cool guitar and fantastic playing. I only remember one other Warmoth (Jazz-Bird). What was the other? I’ve been wary of Warmoth’s compound radius (for no particular rational reaseon). Are you using these? Hi Bill — thanks! The other is the Mongrel Strat guitar, which has been through so many incarnations that I think of it more as a collection of parts than an instrument. The neck currently resides on my lipstick tube Strat, and the bodies in a box somewhere, awaiting resurrection. I’ve been 100% satisfied with all three Warmth necks and bodies. And nobody mentioned Laura Nyro’s “Save the Country”? If only she were still around, I would definitely tell Laura I love her. So underrated, so unjustly forgotten.